Japanese fashion house Yohji Yamamoto has relaunched its fragrance line, including at least two previously discontinued scents — Yohji Homme and Yohji Essential — and one new scent for women, Yohji Senses. Yohji Senses was developed by perfumer Olivier Pescheux; notes include neroli, lemon, pear, ylang ylang, sandalwood and musk. 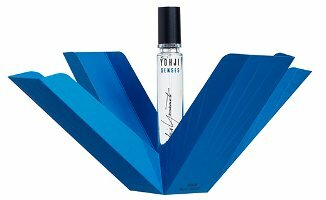 Yohji Senses is available in 10, 30, 50 and 100 Eau de Toilette and 15 ml Extrait de Parfum. Is this the Yohji Homme that Luca Turin raved about in The Guide, bemoaning its demise and begging for its re-release? If so, I’m officially stoked. I’m afraid I am not sure. I do know that many people liked this line, and I think they’re going to release a couple more old ones. Yes, this was indeed the one Luca spoke of so highly. Who knows how faithful the new version is to the original…I hadn’t even been fortunate to sniff the original before it was discontinued. Oh well, c’est la vie….so many other lovely fragrant adventures to be had!!! The original Yohji Homme is a work of genius: Turin more or less called it one of the five best men’s scents ever, and it really is that good. Like Turin, I tried some on and literally could not stop smelling my wrist, so I returned to the store and bought it, thank goodness. I wouldn’t be surprised if some of its ingredients — it was launched in 1999 — are no longer available to perfumers, but I hope they can make a convincing reconstruction, because everyone should have the opportunity to smell it. Just tried on a Yohji Yamamoto the other day. I’m guessing it was the Homme because the opening smelled a little masculine and I think the bottom label said it was eau de cologne. The drydown was fabulous–like a dark colored piece of very thin suede as a skin scent. The bottle was small, probably 30ml and kind of curved and tapered. Can anyone tell me if that’s actually the Homme? The original bottle was almost identical to this new one – a tall cylindrical column, not curved or tapered. I still have several bottles of the original in my library, and am intrigued to discover how the new formulation compares. i have the original/’vintage’ one and i have also just tried the re-release in yohji’s boutique on conduit st in london. i’m happy to report i cannot smell any major (or even minor) differences in this reformulation, they’ve been very faithfulto to the original. fans, rejoice. new fans, do not hesitate in getting this gem.